I currently have an Artley student oboe, but as of tomorrow, I'll be playing on a Moennig Philharmonic full conservatory(w/ 3rd octave key) professional oboe. Vintage REIC. All the bells but minus a couple of whistles. 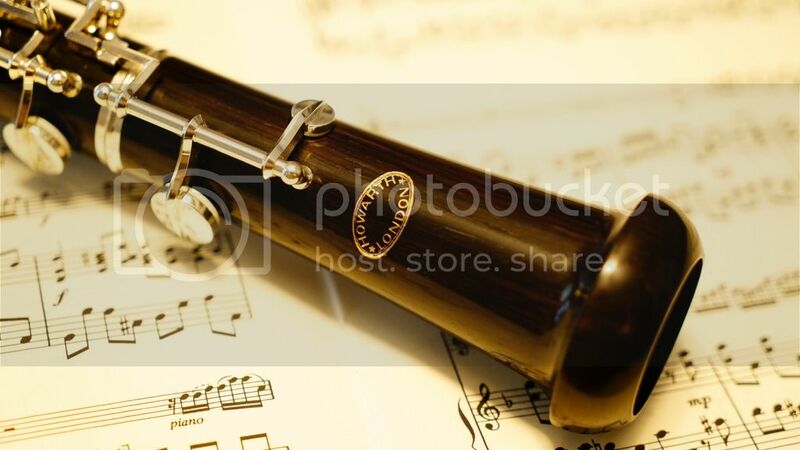 It's a very nice sounding oboe concidering it's age and limited abilities of it's owner. You just can't beat good grenadilla. I've been trying to learn on a Fox Renard oboe after struggling with a Selmer Signet. The Fox is a much easier instrument to learn on. I refuse to make my own reeds though. At least learn to adjust them...otherwise you'll go in circles on the oboe. I got the Moennig Philharmonic, and only then did I realize how much the Artley held me back. Now, I gotta wait for some new reeds! Hmm. I just won an Oboe. A Bulgheroni went for ~350$ while I got mine (wooden Noblet Paris) for less than $200. Fox 400 Oboe and my own reeds, generally from Rigotti shaped and gouged cane on Sierra and recycled Staples. The Fox 400 is a really nice instrument I must say. My teacher didn't realize it wasn't a Loree for a while! Granted...A Loree has made my bad reeds sound good lol, I'm happy with the Fox. Working on buying a Linton English Horn from a friend right now. Those Linton EH's can be hidden gems - at least the ones made by Malerne in France can be. I recently got a Fox 330 for a great price. It's a good oboe for me, since I don't play the beast too often, and the plastic body is pretty low maintenance. I'd love to get a Fox Renard 555 EH to go with it. Initially bewildered with the open hole / closed hole / thumb plate / conservatoire options that came out of initial searches, I picked up what is described as a pre-Loree Cabart cheaply. What can I say - it looks nice, lots of keys, no thumb plate, no idea if it works. Will be looking for lessons later in the year. Dreading the prospect of sorting out reeds for it. In the mean time I might take it to bits and repad it. It needs some work doing to it which is why it was cheap (or at least I thought it was - no idea what it is really worth!). The only real problem with the key work was a single stuck adjustment screw, the solution to which is documented on SOTW - http://forum.saxontheweb.net/showthread.php?t=112695 - with thanks to Ben for contributing to the discussion there. Hope it's okay to bump up this seven year old topic. Up until recently I was playing on a Buffet 4012. It was a decent instrument that I got used for a nice price when I didn't yet play the oboe. However, it lacks the low B-Flat key, any trill keys, third octave key (which was okay), and also just always had a "tinny" sound. When I bought it I thought it would be a completely solid instrument due to the fact that it was entirely wood, but I was a little off. A couple of weeks ago I got a Howarth S40C. My teacher had to work so hard to get me to not buy a Loree (because I played one at a convention and was instantly in love). She succeeded. I even tried the Howarth S50C, but just wasn't much more impressed with it. The S40C is gorgeous both in playing and visually (it's brown! ), I love it. What a lovely instrument. My wife loved her Howarth English Horn, but not how far she had to stretch her fingers to play it. Oh? I love the sound of the English horn. My only experience playing one is once getting to play my teacher's. Although I loved the fact that I was playing it, I do remember it being rather uncomfortable.